Just saw this after checking Sideshow's site. What are people's thoughts about this? I guess it's in the same vein as the Don Post statue in terms of accuracy. With the ready availability of Stormtrooper costumes (even pre-assembled) why someone would invest in this? It looks cool and I like the stand but for a third of the price something equal or better can be had. Though I suppose for the price point the target is a certain type of buyer who would prefer this sort of collectable for their toy room. Looks like a heavy cleaned up idealized hero suit. Maybe the one from efx? You could build an army of accurate Stormie armors on cool flexible mannequins, for the price of this idealized Sideshow Stormtrooper statue. When I first looked at this statue, I thought it might be a Rogue One Stormy. It just had that pristine clean sterile look. 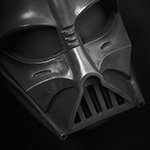 Then I looked more closely at the helmet, and it's original trilogy. Agree with Dave and JKNO. Not sure why someone would spend $8,000 on this.